Go big with your garden art! 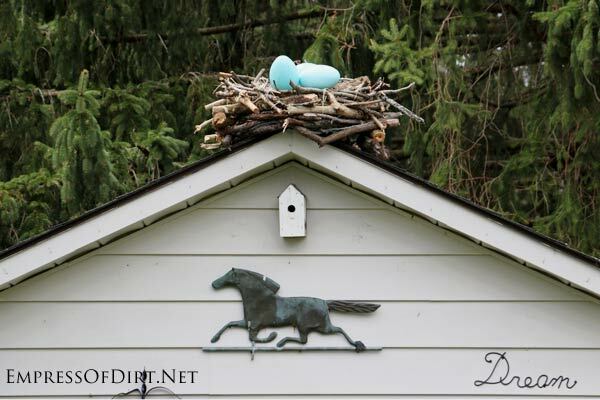 This giant DIY garden art bird nest is made from scrap tree branches and a couple of dollar store supplies. 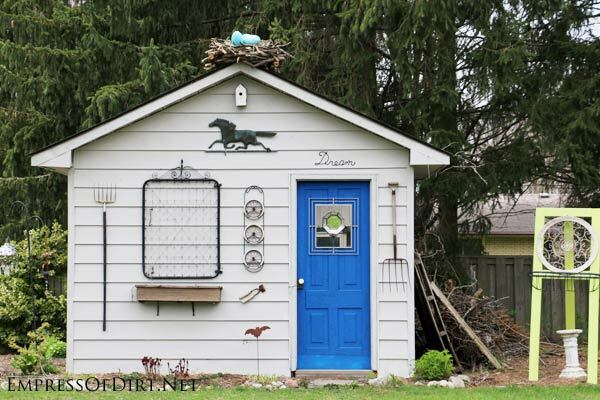 Have fun with it and make a big, bold, birdy statement in your backyard. 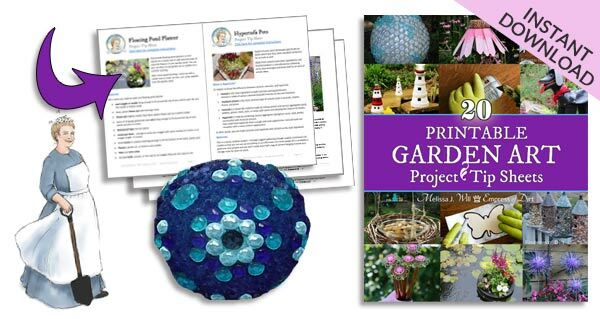 If you would like more frugal decor ideas, see Creative Garden Art Projects. I first dreamed up this project years ago. 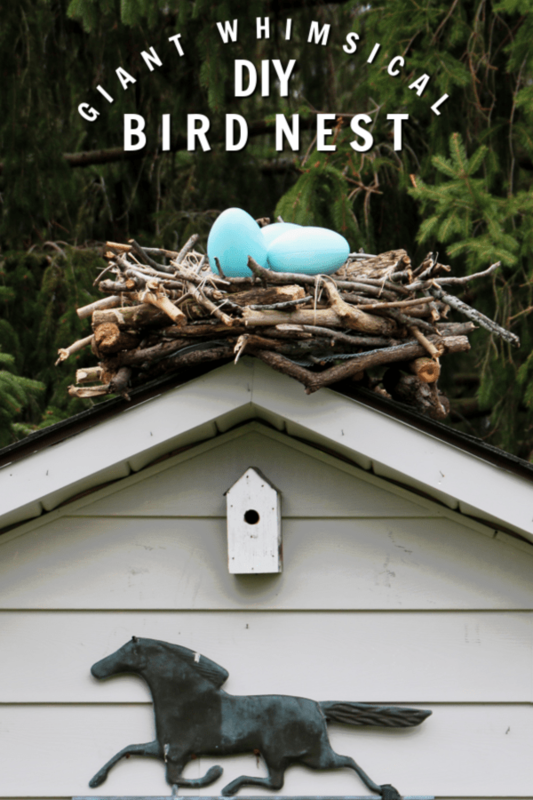 If you’ve been reading here a while, you know I love birds and have a huge fondness for bird’s nests. I also love really big (and really small) art. Average size just seems too average some times! When I first thought about making this project, we lived on a property without any trees. Sad, I know. I used to snoop around on yard-waste pick up day to collect branches. Eventually we moved to our new home and, I’m happy to say, there is an abundance of fallen branches to be found. We live in an area that has a fair number of eagles. They tend to nest at the edge of forests, quite far from the roads, but their nest-building style is easy to spot. There’s no mistaking the mass of branches, twigs, and other debris they have hauled up into the tree tops to form their massive, wide open nests. It’s quite a building feat. Every so often I see an eagle carrying a big branch to its nest and it’s really quite spectacular when you think about the weight they can haul. Plus, the nests look like awesome open-air treehouses which adds to the allure. My giant nest is a hybrid of this. I too used an array of branches but topped it off with big blue eggs to represent my love of the classic Robin’s egg. I have mad respect for nesting birds and you’ll never see a harder working animal than a bird tending to its hatchlings, working long hours to keep those mouths fed. I did not, however, haul these branches to the top of my shed with my beak. I opted to be conventional and use a ladder. I’m actually posting this fully aware that there may not be another human on earth (or elsewhere) who actually wants to make this, but, just in case, I’ll tell you what I did. Small tree branches cut into (30-50) 2-3 foot lengths. Wood saw or chain saw. 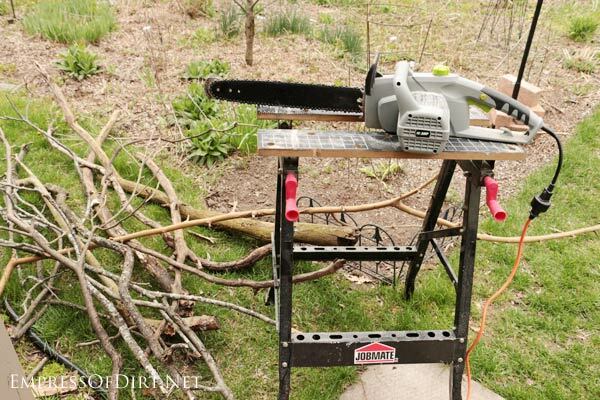 I have a small, electric chain saw and it is really lightweight and easy to use. Twine or wire – depending on how long you want the nest to last. Exterior deck screws (3″) to attach branches together. Hardware cloth, poultry netting, or chicken wire to line bottom of nest. Electric staple gun or small wood screws to attach hardware cloth to underside of nest. (3) Giant plastic eggs. I got mine at a Dollar Store during the Easter season. Plastic primer, acrylic paint, and sealer. I used outdoor Mod Podge. Paint brushes, water, soap, rag. Wire/thread and branch/pipe/post to hang eggs while painting them. Brick to hold the plastic eggs in the nest (more on this below). To make the nest, I first cut a bunch of tree branches into 2-3 foot lengths. I also cut off any side shoots. Be sure to use ear protectors whenever using noisy power tools. Gather your supplies and find a nice, big working space like an outdoor table. To form the nest, place 5 branches in a circle, overlapping all of the ends. Use exterior deck screws or wire to secure the branch ends together. Continue building the nest by adding more and more branches, always working in a circle until it’s as big as you want. You can increase the size of the circle as you build up if you have enough materials. Cut out a piece of hardware cloth or chicken wire to match the shape of the underside of the nest. Secure in place with a staple gun or small wood screws. I found this gave the nest extra stability, and, I can toss more materials in (like leaves and twigs) to fill the nest without them falling out. My nest is about 3-4 feet at the widest points and weighs about 30 lbs. It seemed huge to me when I was making it but actually looks a bit small on the shed. However, I would have had to build it on top of the shed if I wanted it any bigger so I’m happy with it the way it is. I was determined to make this project last year but missed the Easter shopping season by a week. I finally got the eggs at the Dollar Store this spring. These giant plastic eggs have a flat side (which prompted my husband to ask my why I was painting bed pans) but, fortunately, they still look perfectly egg-like in the nest. 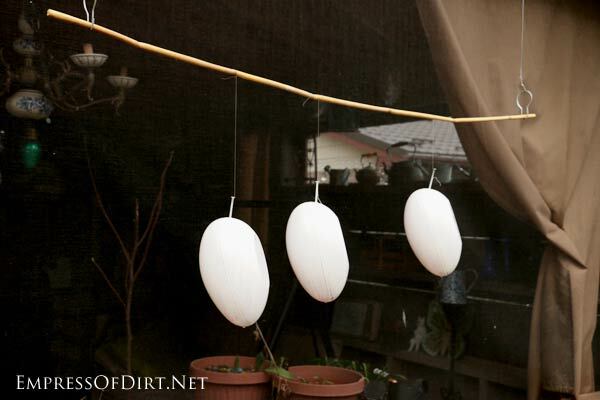 I placed screws in the eggs and suspended them from thread on a stick. This made it easy to use the spray-on plastic primer and (after drying) add the blue acrylic craft paint. When the blue paint was completely dry, I added a few layers of outdoor Mod Podge to protect them. I hauled the nest up a 12-foot ladder to the top of my shed through sheer, foolish will-power. It’s heavy! I thought I might need to anchor it to the shed roof but the overall weight seems to hold it in place. We’ll see how it fares during high-wind storms. To keep the eggs in place, I kept the screws in them. The ends of the screws are wrapped in wire (I use 16-gauge wire for all sorts of garden projects) which is wrapped around a brick (hidden in the nest). They seem firmly in place but, again, we’ll see how they do during those wild summer storms when we get tornado warnings. I guess if a tornado is possible, losing 3 plastic eggs should be the least of my worries. I was envisioning a larger nest, but I’m pretty happy with this one. It’s a cute touch and definitely pays homage to my beloved wild birds. If you actually make one for your garden, I’d love to see it. And I’m happy to finally check this one off my Garden Art To-Make list. 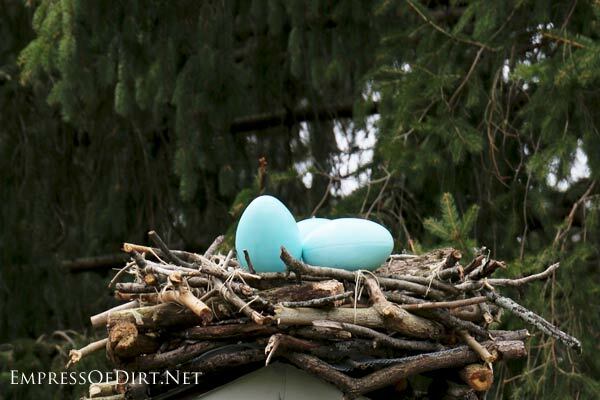 Want another easy way to make bird’s nest? Here’s my wreath hack. I just saw this post and love it! I work with young children and nature and thought this is a perfect idea for stick gathering! It will help children understand the value of sticks! And, they can become the baby birds! I love it! I love the giant nest! I have never seen one nor thought of this before but now I MUST HAVE ONE! I think I will try to build it around a wire wreath frame since I don’t have access to power tools. I will post here if I am successful. Thanks for the awesome idea! Thanks, Susan! I’m quite fond of that nest. Love it! I found you today because i was searching for an image to get started on the giant nest I’ve been planning to do (for 3 years now) on the top of a huge old growth cedar stump in my garden. I have a metal heron statue on top and need the nest to finish. 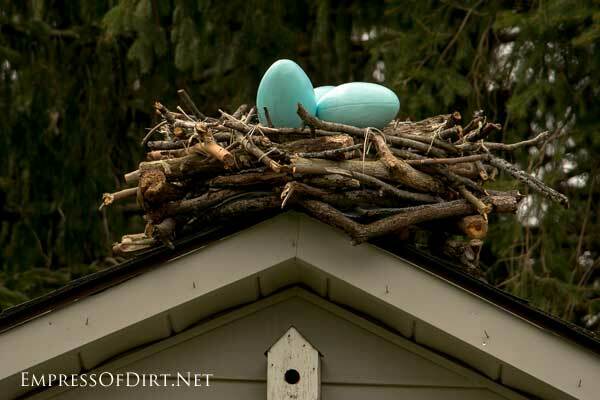 So, no, you are not the only person who would want a giant nest! 🙂 🙂 there are at least 2 of us! Cheers for that, Heather! I hope you’ll show me a photo when you’re ready. Giant bird nest fans of the world unite! 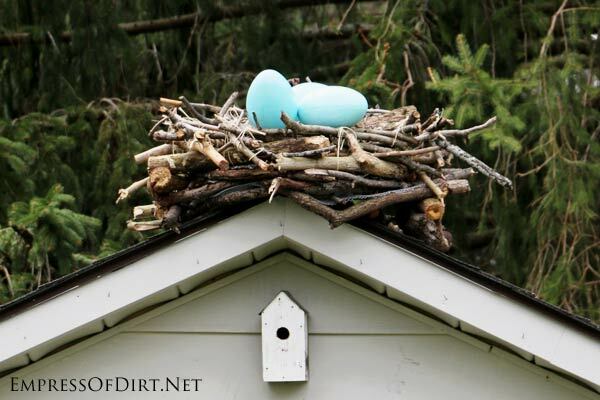 LOL-I hope the “Mama” bird doesn’t land on your shed and squash it! 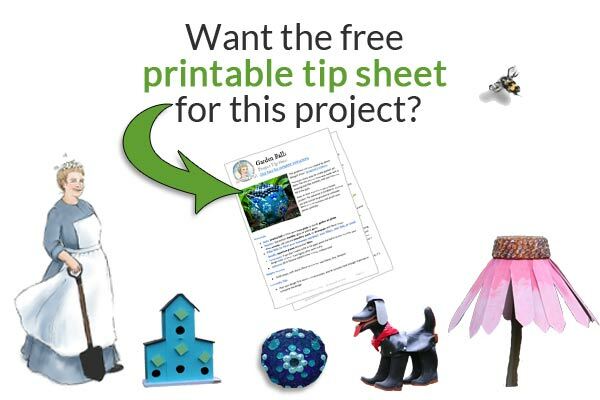 Absolutely fell in love with this project…Have got to try this…I have a pole with a very sad falling apart birdhouse on it…will be perfect. Now my neighbors will shake their heads and talk about the crazy old woman down the street…. If you make it, I’d love to see it! ADORABLE is your shed, the nest and you!!! I can’t wait to do pretty much the same thing! I’m glad I found you and your ideas. I love your nest and need to build one for the top of my gate,been trying to think of something for it. Thanks Melissa. Thanks, Marlene! I quite love it. If you make one, share a picture with me. I would love to see it. The gate idea is a fun one. When life gives you dead fruit trees, make bottle trees with huge bird’s nest at top! Oh my … thank you sis … I haven’t seen a project that I could get passionate about for some time now … and this is Wonderful! I am SO going to give this a try … hope I don’t bite off more than I can chew. 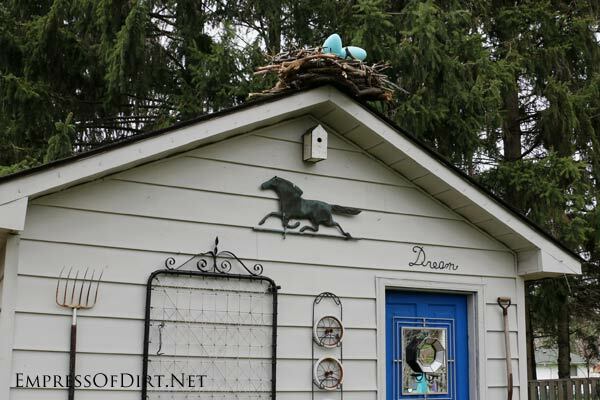 Personally, I love a nest that you build with a chain saw! : ) How fun! I think you came up with a great idea! Thanks for all your topics. I really enjoy reading them! Thanks again.